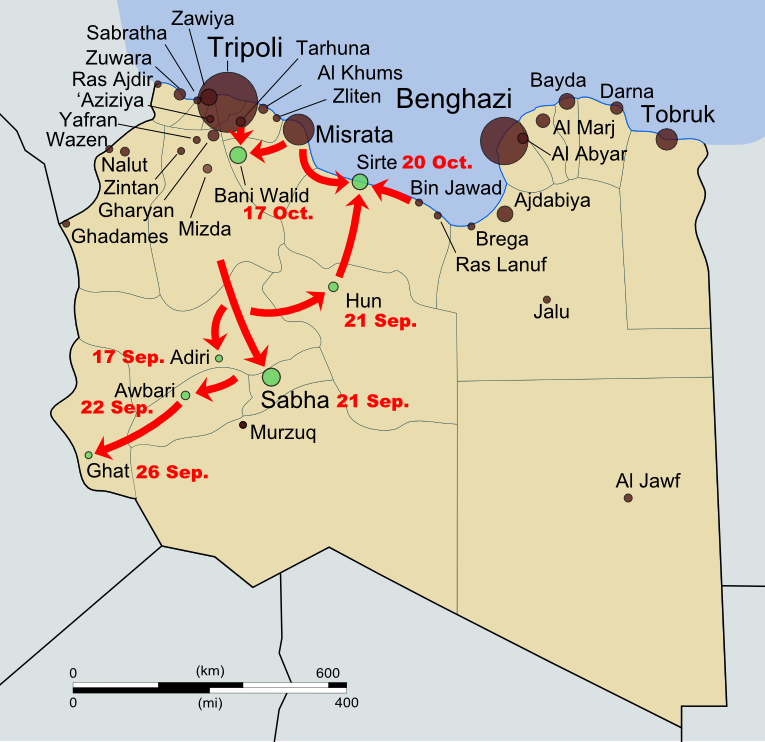 Map of the last stage of Libya's 2011 civil war (click to see full map and original article). Map by Evan Centanni, based on public domain map from Wikipedia (source). Last month, the North African country of Libya changed its official long-form name to "State of Libya" (Arabic: Dawlat Libya). This comes as part of Libya's governmental transition following its 2011 civil war, in which a rebel coalition defeated the regime of dictator Muammar Gaddafi. Over the last year, the country's formal name had not been clearly defined, with the country referred to in most documents simply as "Libya". The rebel National Transitional Council had only made a point of ceasing to use the Gaddafi-era name. During the last decades of Gaddafi's reign, the country was known in long form as the "Great Socialist People's Libyan Arab Jamahiriya". The word "jamahiriya" was coined by Gaddafi by combining the Arabic words for "republic" (jumhuriya) and "the masses" (jamahir). The new name, "State of Libya", voted in by the country's General National Congress on January 8th, is intended to be temporary pending the approval of a new national constitution. However, it is entirely possible that the constitution, once drafted, could also choose to use the same name. This marks the third year in a row that a country has changed its official name during the year's first two months: last January, the Republic of Hungary changed its name to just "Hungary", and in February 2011, the Republic of the Fiji Islands shortened its name to "Republic of Fiji".